Nestled between the scenic Baldwin Hills Overlook and bustling downtown Culver City, you’ll find ACCESS Specialty Animal Hospital – Los Angeles. We’re open 24/7 for emergencies and can accommodate visits for cardiology, internal medicine, interventional radiology/endoscopy, surgery, nephrology, neurology, urology, and zoological medicine (avian and exotics) during business hours. Add in our state-of-the-art medical equipment and we’re the obvious choice for animals in need in the Los Angeles area! Our practice is located within the City of Angels, a facility that houses other independently owned and operated specialty practices allowing for direct collaboration with specialists in dentistry, dermatology, oncology, ophthalmology, and radiation oncology. Please, don’t hesitate to call us at (310) 558-6100 day or night! 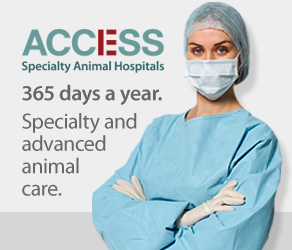 Click to here to view Doctor listing by all ACCESS Hospitals and Departments. We are delighted to announce that ACCESS - Los Angeles is now a Verified Trauma Center. Click for more information.